"We can customize a solution for your business." Duplo has the Esper DM-230V direct mail collator for applications where catalogs, postcards, and flat sheet ads need to be collated together with or without a wrap-around cover. We have a video listed below. We can customize a solution to fit your requirements. Please give us a call at 501-821-4579 to discuss your applications or equipment needs. 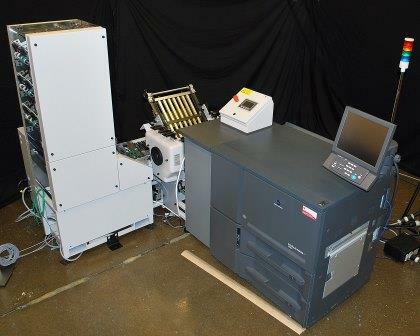 Do you need faster carton insertion for your printed documents? Make your Ecommerce jobs easier, and save time with the newest Century Series Box Insertion Solution. Start out with a commercial grade print engine. Print your customer's personal information on blank or pre-printed forms. Then the solution folds your document (1 to 2 pages) and places on a turn conveyor (Right Angle), this turn conveyor helps with limited floor space. Then scanners read the carton and the document to insure every time that the correct document is inserted into the correct box. Each system is designed to fit with multiple height conveyors and box variable sized boxes from 1" to 48". This solution can run at a rate of 15 - 18 per minute with box verification. Without verification speeds of up to 30 can be achieved. Here is a short video of the unit during a test simulation. Doing a large run of shipments that need the same piece of information inserted into your boxes? We have the color print solution that will make any Marketing team happy. Need additional sales/marketing information put into your customers shipments? Just ask, we can provide a solution for you. Want to get your customers invoices into their boxes automatically? Baumfolder provides a wide variety of document solutions for the Ecommerce market. Our variable data systems also known as our Print, fold, and insert solutions, can be tailored to many different specifications and meet many different design applications. Please give us a call at 501-821-4579 and ask for Todd Hastings. Boxes of all size. One Conveyor. No Problem. The Baum Century Series Print/Fold/Apply Solution solves the problem of variable size boxes on the same conveyor line. With robotic systems, boxes of various sizes can move down the conveyer line with fast and accurate document placement in each box. Documents can be placed inside, and/or glued to the outside with use of a pouch. Tailored to your specific needs, you can get on-demand printing with gathering, folding, timed insertion and bar code verification. Our Century Series document insertion solution takes preprinted materials and folds and inserts into boxes. Add customer-specific information for personalized invoices, packing slips, and promotions. With bar code verification, eliminate customer service problems. Gain speed with insertion rates of 20-30 boxes per minute*. Gather up to 7 personalized sheets for insertion. Call 501-821-4579 for further information. The Duplo Esper DM-230V Direct Mail Collator has been designed to meet the growing demand for organizing assorted marketing literature which is either mailed or inserted into a product box. Sets incorporating a range of materials such as leaflets, brochures, and postcards can be quickly collated and wrapped around with a cover ready for distribution. Click on the picture for a larger view. Call Todd Hastings at 501-821-4579 or email budsgraphics@sbcglobal.net for more information.